Star Wars Knight Errant Deluge collection on sale today! April showers bring May floods — at least on Aquilaris, where Kerra Holt tries to save the planet she once called home from the storms in Star Wars: Knight Errant - Deluge. The trade paperback goes on sale today, and can be obtained from your local retailer, from Amazon, or from Things from Another World. 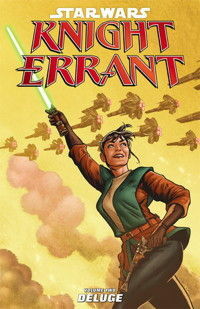 And in two weeks, Kerra Holt's adventures continue with Star Wars: Knight Errant - Escape #1. I've finally gotten around to creating pages for the issues announced so far — #1, #2, and #3 — here on the site, as well as a landing page for August's Lost Tribe of the Sith - Spiral #1. Some great covers on those, be sure to take a look. Spiral will be available for preorder in June. I speak about both of the series in the Fictional Frontiers podcast, just released here. Just back from a trip south to TimeGate, which I enjoyed immensely — participated in a lot of panels on comics and the 35th anniversary of Star Wars. A very fun show! The notes for Star Wars: Knights of the Old Republic #5 are now online — just hours to spare before I begin my trip south. See them here — and of course, the comic book can still be obtained from your local comics shop or from TFAW. That trip includes a signing from 3-5 p.m. on Wednesday, May 23 at Comics Exchange, 3711 Chapman Hwy, in Knoxville, Tenn. I went to undergrad school at UT Knoxville, and it'll be great to get back to town. And then it's off to Timegate 2012 in Atlanta from May 25-27; I'm involved with several hours of programming there. The schedule's on the site. 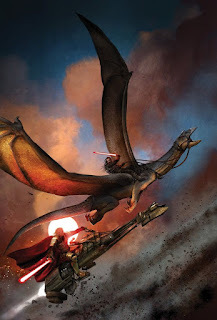 So, with Knight Errant: Escape starting up next month and Lost Tribe of the Sith coming later in summer, folks have been asking what's next for Zayne Carrick. As regular readers of the blog know, before War when the question would be asked, I would say "the future is always in motion." And so again now. So keep spreading the word about the comics — the War trade paperback should be along soon! And in addition to Star Wars: Knights of the Old Republic - War #5 going on sale today, Dark Horse on its Facebook page has released a sneak peek at the covers for the comics in August, including Star Wars: Lost Tribe of the Sith - Spiral #1 and, for the first time, Star Wars: Knight Errant - Escape #3! More crackling Sithy goodness -- or badness! Benjamin Carré's covers are the best comics covers I've seen in a long time. Be sure to order the first issue, shipping in June, from your local retailer or from Things from Another World! And the final issue of the Star Wars: Knights of the Old Republic - War arc hits stores tomorrow, almost exactly a year after I first wrote the plot for it. It's true — comics are like time travel. Writing them, anyway! Notes to come as soon as I get time — hopefully sooner this month than last month. Following this, the first issue of Star Wars: Knight Errant - Escape will be going on sale in June — be sure to get your order in now. And then the Lost Tribe of the Sith comics series begins in August. Extraordinarily busy — I haven't even gotten to see The Avengers yet! 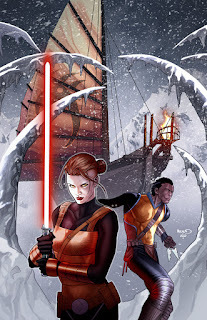 Star Wars: Lost Tribe of the Sith -- the comics series! Happy Star Wars day, all — and I am pleased to be able to reveal the Secret Project I've been hinting about from time to time on Twitter. USA Today has the first interview about it — the Lost Tribe of the Sith comics series from Dark Horse! As the interview says, the comics story picks up not long after where the new novella in Lost Tribe of the Sith: The Collected Stories leaves off. The "Pandemonium" novella is set in the lifetimes of the characters from the final e-book episode, "Secrets" — and so is the comics series. As always, all the stories are complete and you don't need to read one to enjoy the others — but Lost Tribe of the Sith - Spiral gives us a continuation of the history of the Lost Tribe. The cover the first issue by Paul Renaud, at right, depicts Takara — a protector of law and order for the Tribe on Kesh — and Spinner, anarchist leader of a band of outlaws. If he can't rule the Tribe, he'll bring it down! As you can see, we'll be visiting locales on Kesh we've never seen before. Andrea Mutti from Knights of the Old Republic - War will be giving us our first looks at everything in the prose stories from Keshiri to uvak. We've worked to design a complete fantasy world. It's Star Wars through a different lens — no technology, very little metal, and no Jedi! We've timed it so both the prose book and the first issue should theoretically be available for Star Wars Celebration VI. I'll see you there! Lots of Star Wars stuff going on. I've just received my copy of Star Wars: Knights of the Old Republic - War #5 from the publisher; it goes on sale on Wednesday and features someone folks have been asking to see. And order now to be there for the launch of Star Wars: Knight Errant - Escape in June — it's our best KE storyline yet. Finally — tomorrow is Free Comic Book Day, marking ten years since the first one; I have my own reminiscence about it here. As with last year, I'll be signing my Star Wars, Mass Effect, and Iron Man comics at Chimera Hobby Shop, 808 W. Wisconsin Ave., Appleton, Wis. from 11:00AM to 1:00PM, and again from 3:00PM to 6:00PM. Lots of free comics are on offer this year: you can find the full list of titles here. Signing schedules can also be found on their website. There's also a handy FAQ page on the site. If your local comic shop is not listed, give them a call for a complete list of events and signings. May the 4th deals: Almost forgot -- both Amazon and TFAW are running big deals on Star Wars stuff for May the Fourth. Check 'em out!